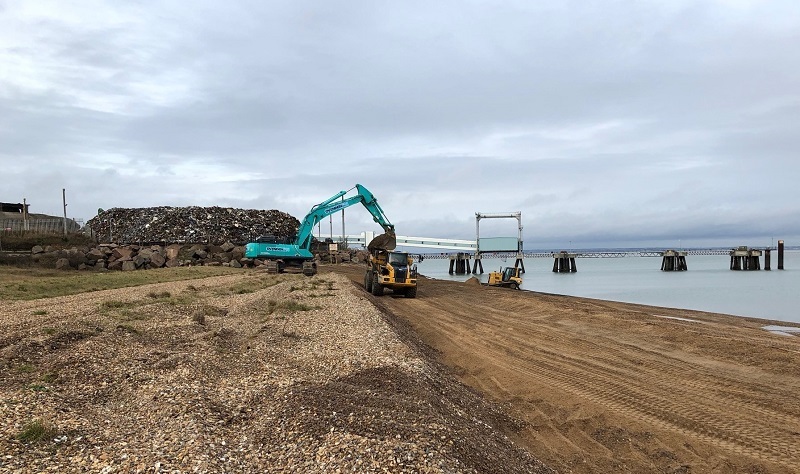 Work is underway on phase one of a major beach recycling project which, when complete, will provide improved protection against flooding to approximately 5,500 homes located in and around the town of Sheerness. The Sheerness Beach Recycling Scheme is being delivered by Mackley as part of Team Van Oord and on behalf of the Environment Agency, East Kent Engineering Partnership and subcontractor Ovenden Earthmoving. Work got underway in Mid December 2017 and phase one is scheduled for completion by mid-February. This first phase alone will protect some 3,000 homes, and by the time the scheme is complete that number will rise to 5,500 homes. In total the Environment Agency is tasked with reducing the risk of flooding to more than 300,000 homes within the current government spending review period, and has developed a new Programme Delivery Unit* approach to help with this. Sheerness beach is a ‘Blue Flag’ award winning (2016) bathing beach located centrally in the town of Sheerness on the north coast of the Isle of Sheppey. The predominantly shingle beach is characterised by a steep high sea wall with floodgates at regular intervals. Steps lead down from the flat, wide seaward promenade to the pebble beach. The replenishing works are being carried out in the area between Garrison Point and Sheerness Sailing Club, nr Bartons Point, which fronts the town of Sheerness and the large village of Minster. The land is low lying in the west and the beach and defences protect a large flood basin which covers the majority of Sheerness and surrounding areas. The current Standard of Protection against overtopping within the Sheerness and Minster frontage is currently above one in 200 years for its whole length. The beaches at Garrison Point and east of the Neptune Jetty are being used as extraction sites. The shingle that naturally accumulates in these two areas is being utilised to recharge depleted sections along the rest of the beach. In order to optimise the natural tidal processes, the shingle is placed at two locations and allowed to naturally recharge the frontage. “Vehicular access to site is via the beach frontage, with strict instructions that all vehicles must avoid the vegetated shingle within the protected conservation zone. “We are liaising with Environment Agency’s ecologist throughout the works to ensure there is no damage to the vegetation in these areas. As part of the project, Team Van Oord is also appraising the structural condition of the stepped revetment adjacent to the Tesco store, Neptune Jetty and the landward face of the rock revetment at Bartons Point. Team Van Oord will then detail any repair works required and put forward recommendations as to the preferred options for carrying out any repairs. The Environment Agency is tasked with reducing the risk of flooding to more than 300,000 homes within the current government spending review period. The Agency’s supply partners suggested that the pace of delivery of flood risk management schemes could be increased through the establishment of multi-disciplined, co-located, integrated teams. This approach has worked successfully in relation to the delivery of other programmes of work and has the potential to improve cost efficiencies and reduce project lead times. In response, the Environment Agency has developed the PDU approach – with input from Team Van Oord as one of its Tier One suppliers – to support and drive the delivery of the flood risk management programme within different geographical areas.